Verdi’s masterful setting of Shakespeare’s famous tragedy is filled with dark colors and vivid emotions. 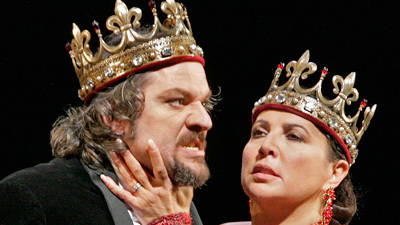 The music brilliantly depicts the souls of troubled Macbeth and his conniving, relentless wife. Bringing Verdi’s vision to life requires not only great singers, but great actors as well—Cornell MacNeil and Irene Dalis excel in the challenge. From the first encounter with the witches to the murder of the King and the gradual disintegration of their souls, this couple masterfully conveys all the horror and pathos both Verdi and Shakespeare intended.